ORLANDO, Fla. - It seems everyone is looking for ways to go green and protect the environment these days, including the city of Orlando. The city is doing its part in the fight against garbage by providing homeowners with a free compost unit. Rebecca Roska, an Orlando resident, is taking advantage of the deal after her 4-year-old son insisted they get it. "He really wanted one because he loves worms," Roska said. 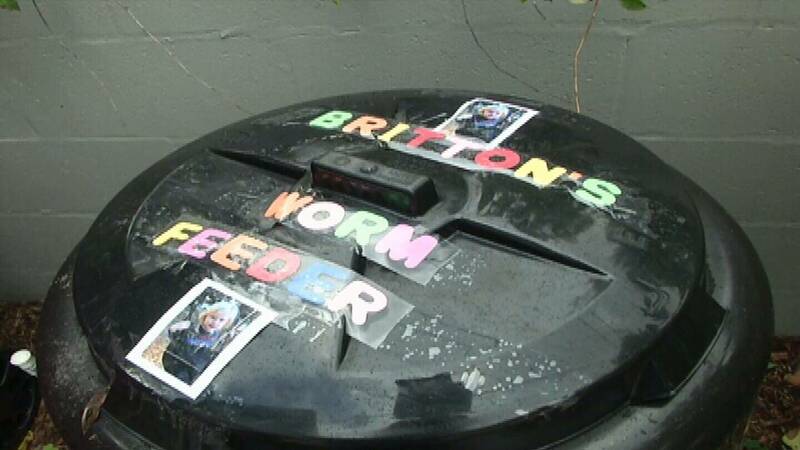 She said the small plastic container now sits on the side of the family's driveway and is decorated with the boy's name in colorful letters. Rosko said she places most of her kitchen scraps inside the compost container. That garbage is then turned into dirt that can be spread into plant pots and gardens. "To get your compost out, you just lift this up and then it all kind of comes out and you can kind of see, there's some of the dirt kind of forming," Roska said. Since she doesn't have a garden to fertilize, she shares that dirt with her neighbors so they can put it in their yards. The mother of two was initially worried the composting would attract uninvited guests or odors. "We have not had problem with a rodent, not any problems with smells or anything like that. It tells you what you can put in, so it's all vegetables, fruit, you know, definitely no meat products, no dairy products," Roska said. Through composting, Roska also gets rid of unwanted junk mail and other papers scraps, which eliminates the amount of trash she puts out all together. "Probably now, we could go without having our garbage serviced -- probably every two weeks and we only now have one bag of garbage every two weeks," Roska said. Roska was also pleased with how smooth the process of requesting the compost unit was. "It was so easy. So, we went online, we put in our address and they dropped it off for us seven to 10 days," Roska said. Michael Carroll, the manager for the Solid Waste Department of Orlando, said he's seen other customers who are also happy with the benefits. "It's been pretty helpful. I know a few residents I've spoken to think that maybe they give us 15 or 20 percent less food garbage and many haven't put a bag of leaves out in ages," Carroll said. But Carroll said composting is helping more than just the environment. He said it's also helping customers save time and money. For Roska's son, Britton, it's also been a fun learning experience. "He loves it and he's kind of the regulator of it. That can go in the worm feeder and so he gets his pets and we get less garbage," Roska said. The compost unit is free and available to anyone who lives within the city limits and resides in a single-family home or duplex. Click here to submit a request for a compost unit of your own.